At Vicky Featherstone’s first Royal Court press briefing, there was an intriguing statement of intent about the theatre’s direction. As well as reaffirming the theatre’s commitment to writers, handing over the keys of the building for a summer season led by the playwrights, Featherstone made a comment with potentially far-reaching implications for the future role of the Royal Court. She said, with a playful grin, “no space should be safe from theatre”. As the new artistic director went on to explain, she’s interested in utilising different spaces within the building, in taking shows outside the Royal Court’s home in Sloane Square, and in bringing new audiences through its doors. It’s perhaps not surprising that Featherstone, who has led the nomadic National Theatre of Scotland for the last eight years, should want to look beyond the restrictive and arguably exclusive boundaries of the Royal Court’s four walls. What’s more striking is that she’s not alone. While “audience development” has long been a key part of theatres’ PR arsenal, this can often be just so much empty rhetoric. Now, however, there seems to be a genuine commitment to opening up theatre spaces, venturing beyond bricks and mortar and establishing theatres as a vital part of their surrounding communities. It’s a development that’s sorely needed and one that might, if successful, ensure a future life for theatres within an arts funding landscape that is looking increasingly precarious. At last year’s Theatres Trust conference on delivering sustainable theatres, Griff Rhys Jones championed the theatre as a place of public assembly in modern day communities, taking on the civic role once occupied by the town hall or community centre. 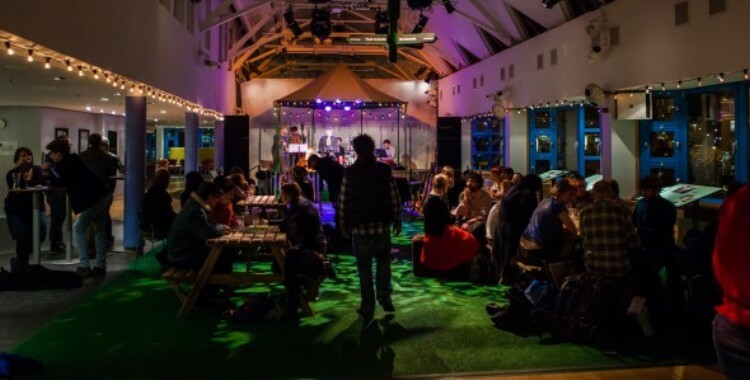 While a vision of the theatre as the beating heart of the community is perhaps a little utopian, there are ways that buildings can connect with local residents through more than just their artistic programme. Just look at Battersea Arts Centre, where experimental performance jostles alongside yoga classes and tea dances. Artistic director David Jubb is keen to retain this diverse make-up of functions, hoping to achieve an overlap between the venue’s two distinct strands of activity, while ongoing improvement works will make the building structurally more open. Beyond London, this gesture of opening out is even more essential, particularly as other public spaces are threatened. Rhys Jones has pointed to the example of Derry Playhouse, which is open to local people throughout the day, functioning almost like a community centre. There are other similar if not quite so far-reaching examples. Chapter Arts Centre in Cardiff has worked hard to create a welcoming environment that encourages people to drop in, while one of the key pledges made by West Yorkshire Playhouse’s new artistic director James Brining is to open up the building and explore the way the theatre relates to its communities. One of the few things theatres do have is space, much of which lies dormant when not being used for performance. Why not fill it? As well as inviting audiences in, establishing theatres as buzzing hubs of the community, venues might look outwards. As buildings hold less prestige than they once did, there is the opportunity for theatres to redefine their identity beyond their own walls. West Yorkshire Playhouse has effectively demonstrated this approach with the city-facing programming of this year’s Transform Festival, including a piece of performance made with local residents and performed outside the theatre. The challenge, of course, is to expand this beyond the fleeting festival context. But does all this shift the focus away from the art itself? There are clearly potential pitfalls for such an approach – particularly if treated as a careless add-on to tick funding boxes – but the community benefits need not be at the expense of the theatre. At their best, each can positively impact upon the other. Fresh influences enter the building, disrupting and invigorating a process of theatremaking that might otherwise become stultified, while new potential audience members are given the opportunity to encounter the work and be surprised. None of this is to say that theatres should abandon their core activities; rather, as ever, they need to adapt. Buildings have always been one step behind the performances and audiences they host, running to keep up. Think of the exponential growth in site-specific work over recent years, to the point where the National Theatre is now selling tickets for Shunt and Punchdrunk shows taking place miles away from the South Bank. The need from local communities and potential audiences is there, the only question is whether theatres will step in to fill the gap. In her recent keynote speech addressing the thorny issue of arts funding, culture minister Maria Miller firmly stated that the arts need to make the case for their ongoing importance in economic rather than artistic terms. It’s a statement that has prompted an understandable backlash, pinpointing many of the dangers and inadequacies of measuring the arts’ value in purely monetary terms. But perhaps theatres’ greatest argument for their survival is the role they might play within their local areas – artistically, economically, and as a central component of the community.